For the past three years, The Port Gaverne Hotel near Port Isaac has been voted Cornwall’s top pub at The National Pub & Bar Awards. Last week at a Michelin-star-studded ceremony held at BAFTA in Piccadilly, London, they went one better and were named best pub in the South West. 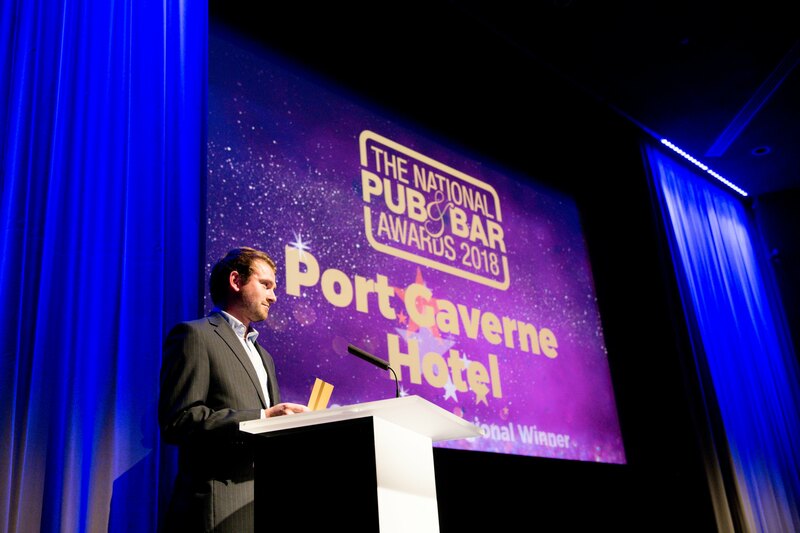 The regional award, which considers pubs from Cornwall, Devon, Dorset, Somerset, Wiltshire, Gloucestershire & Bristol, has a history of boosting the profiles of its winners and is considered a major prize in the industry. For landlords David & Jackie Barnard, it’s the icing on the cake after a string of awards including Best Pub in Cornwall, Top 50 Gastropubs and St Austell Brewery’s Tenant of the Year. David puts their success down to three things: produce, attitude and motivation. With Restaurant Nathan Outlaw winning UK’s best restaurant in 2017 and Port Gaverne Hotel picking up multiple dining and accommodation awards over the past 3 years, the area is fast becoming Cornwall’s go-to spot for gourmet holidays. The Barnards run three establishments all within half a mile of each other and have no plans to let up. Pilchards Cafe, right by the beach at Port Gaverne, opened last year offering after a half million pound investment, backed by St Austell Brewery. With an open kitchen, it offers seafood tapas & sharing plates alongside a wide choice of local gins and brews. Five minutes up the headland is Stargazy Inn (AKA Wenn House in the TV series ‘Doc Martin’). The luxury B&B is currently being refurbished with a new kitchen, bar, and a decked terrace overlooking the bay to Tintagel. Stargazy will be open to the public for food and drink in June. See latest menus and reserve a table here.